In recent decades, big issues have been often discussed and debated in the field of architecture: from city to climate change, from megaform to infrastructure, even including bigness itself. Has architecture been merely contextualized in a grander theoretical framework or is it beingactually transformed and possibly super-sized by these concerns? Over the last four decades, Correa has done pioneering work on urban issues and low-cost shelter in the Third World. From 1970-75, he was Chief Architect for 'New Bombay' an urban growth center of 2 million people, across the harbor from the existing city. In 1985, Prime Minister Rajiv Ganhi appointed him Chairman of the national Commission on Urbanization. One of the few contemporary architects whose projects address not only issues of architecture but of low-income housing and urban planning as well, his work has been published in many architectural journals and books, including the 1987 Mirmar and the 1996 Thames & Hudson monographs devoted to his work. He has taught at universities both in India and abroad, including Harvard, Penn, Tulane and Washington Universities, and has been the Sir Banister Fletcher Professor at the University of London, the Albert Bemis Professor at MIT, and the Jawaharlal Nehru Professor at Cambridge. In 1980 Correa was awarded an Honorary doctorate by the University of Michigan, and in 1984 he received the Gold Medal of the Royal Institute of British Architects, in 1987 the Gold Medal of the Indian Institute of Architecture, in 1990 the Gold Medal of the UIA (International Unin of Architects), in 1994 the Praemium Imperiale from Japan, and in 1998 The Aga Khan Award for Architecture. "I Live in a Steven Holl"
How many people can say that they've lived a chunk of their lives inside the walls of a starchitect-designed building? In light of September's Back To School spirit, this is the first in a short series in which we peek inside unconventional living spaces on a college campus (specifically at the Massachusetts Institute of Technology, where this writer is currently based.) We talk to Amanda Levesque and Renee Reder, two architecture students at MIT who call Steven Holl's Simmons Dormitory their home. Simmons Hall is often casually referred to as "The Sponge," which was also Steven Holl's driving concept for this dormitory. How is this idea manifested throughout the building? Amanda: Porosity is the main theme, and Steven Holl littered the whole dorm with organically-shaped pores. There are over 3,000 small 3'x3' windows, circular ventilation openings in the showers, and the small perforations in the wood paneling. Renee: There are also blob-shaped lounges and study rooms, which are supposed to be the "lungs" that draw air into and up through the building. Natural light was a top priority--with only one major hallway running through lengthwise, its footprint is very skinny, and can allow light and air to flow easily from one side of the building to the other. One of the "lungs" of Simmons -- this is the largest lounge whose lopsided atrium brings in much-needed natural light. The curvy walls are a well-known quirk of Simmons. How does it enhance--or detract from--your living experience? Renee: Curvy walls are cool, but it makes arranging furniture a real headache--most students don't want them. I really enjoy being in the blob-shaped lounges, but Steven Holl probably didn't think of how the inverse of them would affect students' rooms. But since they're built from concrete, they make for rather excellent chalkboards. Amanda: The funny thing is, Steven Holl didn't really quantify the exact shapes of the curved walls when he designed it. He only had plans, and so when this was built, they printed out the plans literally at full scale and the builders went off of that. As you go up floors, you can see through the changing curvatures that they improved their aluminum-stud technique as they went along... I know that some floors don't pass all the way through the building, and some are punctuated by terraces, which makes for elevator confusion and general difficulty getting around. How has the structure of Simmons influenced the culture? Amanda: It's interesting -- Simmons is not exactly floor style, but not exactly suite style. I live in a tower on a higher floor, which is a smaller niche group. Long floors have a bigger 'dorm' community. Renee: I agree - the architecture creates a wide variety in living groups, and has a huge effect on social relationships. What kind of furniture do students use? Amanda: Steven Holl designed custom, modular furniture for Simmons Hall as a whole. Two drawers equal the height of the bed, and three drawers equal the height of a wardrobe. Basically, there are about 12 different configurations. Renee: And as a result, students get to somewhat 'design' their room. It's like a kit of parts! Renee capitalizes on space by placing the modular drawers underneath the bed. However, this configuration precludes sunlight from entering the room via the lowest row of windows. Since MIT students get to select where they want to live freshman year, why was Simmons your number one choice? Renee: I really liked the offbeat culture of Simmons, which may in part have been inspired by the architecture. For example, Steven Holl designed a specific 'meditation room' for us, but it went unused for years...until some students awhile back turned it into a massive ball pit. Amanda: Simply, because it has the best facilities--we have a movie theater, fitness center, dining room... It was built in 2002, and is the newest dorm on campus. I love it. A glimmer of light has been shed over the gloom of Dubai's construction industry this week as contractors have been appointed to work on the world's tallest residential tower, set to grace the skies of Dubai in just two years. Pentominium, designed by Dr Andrew Bromberg, Executive Director at Aedas, is currently the 6th tallest building under construction but not topped out according to statistics from the Council for Tall Buildings and Urban Habitat. Once completed - by the newly appointed Lebanese construction firm, Arabian Construction Co - it will provide 116,200 sq m floor space...and a much needed lift of confidence in the Dubai market. Not the austere symbol expected of a land in financial turmoil, the Pentominium will maintain the modern ethos we've all come to expect from Dubai: 'more is more'. Trident International Holdings have collaborated with some big players to offer the height of luxury. Complete with a banquet room, sky lounge, observation deck, business centre and even its own cigar lounge sponsored by a collaboration with Davidoff fine cigars, if you like hotel-living this could be right up your street. The tower itself is not out of place in Dubai. It's tall, really tall at 516 m. But what makes the design intriguing is its height to width ratio - this is an extremely slim-line design. Aedas explain the shape resulted from the project's main challenges of 'density/proximity to neighbours and the extreme environmental pressures of Dubai'. Addressing this issue the building is split into two sides, one which features a system of balconies and a vertical layer of glass to mitigate solar gain, and one which is staggered with sky gardens and apartment pods of one storey height, breaking up the density and offering privacy to outdoor space. Having won several awards at the Arabian Property Awards before the financial crisis hit, the appointment of a contractor is a positive sign that quality projects can pull through the tough times, even in Dubai. The Russian avant-gardist Wassily Kandinsky — who dressed like the college professor he had trained to be and sounded like a mystic when he wasn’t thinking like a scientist — is the central god in the Guggenheim pantheon and genesis myth. The museum owns more of his work than of any other major Modernist and mounts some form of full-dress Kandinsky show like clockwork every 20 years or so. It’s that time again. The Guggenheim’s last excursion into Kandinsky occurred in the early 1980s with three context-heavy exhibitions that examined his activities in all mediums, including his Art Nouveau embroidery and works by contemporary artists and designers. This one takes the opposite tack. It distills Kandinsky’s momentous career to about 100 paintings, with a large side order of works on paper displayed in an adjacent gallery. The canvases and almost nothing else fill Frank Lloyd Wright’s great rotunda from bottom to top, sometimes at the magisterial rate of one painting per bay. This looks sensational. Organized with the Städtische Galerie im Lenbachhaus in Munich and the Pompidou Center in Paris — sites of the world’s other major Kandinsky collections — it contains stupendous loans from all over. The 1911 “Picture With a Circle” from the Georgian National Museum in Tbilisi has never been in this country. A big, gorgeous blur of resonant blues, greens and purples electrified by a few black lines across the top, it is said to be the artist’s first completely abstract painting. But this is only relative: Kandinsky is so pertinent to the present because he tended to ignore the distinctions between abstraction and representation. In all, this show is the perfect cap to the Guggenheim’s yearlong birthday celebration of Wright’s building, which opened 50 years ago on Oct. 21. Lots of museums have foundational artists. The Museum of Modern Art has Picasso and Matisse; the Whitney Museum of American Art, Edward Hopper. But Kandinsky is the angel in the architecture at the Guggenheim; he’s part of the bedrock. The circling ramp of Wright’s rotunda was surely designed with that Russian’s swirling, unanchored abstractions in mind. Kandinsky’s precarious, ever-moving compositions suggest that he never met a diagonal he didn’t like; Wright obliged with a museum on a perpetual tilt. The purity of the present show limits Kandinsky’s immensity a bit. It simplifies a vision that held music, painting and language as part of a continuum and relegates his activities as theoretician, essayist, poet and (arts) community organizer to the show’s informative, discreetly placed wall texts. In both of his best-known books — “Concerning the Spiritual in Art” (1912) and “Point and Line to Plane” (1926) — he displays a remarkable ability to reconcile the redemptive power of art’s “inner pulsations,” meant to be experienced “with all one’s senses” and exacting diagrams of the formal effect of different colors, shapes and lines, each of which he felt had a distinct sound. There are formalist possibilities in these pages that Clement Greenberg never imagined. The impact of his thought on his contemporaries was tremendous. It is always startling to learn, for example, that Hugo Ball and the Zurich Dadaists revered Kandinsky, included his paintings in their exhibitions and read his poetry at their soirees. Some of these poems are virtual prescriptions for performance art. For example, “Not,” in his collection “Sounds” (1912), describes a “jumping man” who “dug a small very round depression” in the ground and “jumped over it without stopping every day from 4 o’clock to 5.” More than a few gallery receptionists of the moment have witnessed things like that. Kandinsky was alternately propelled by ambition and history itself. By 1901, barely six years after the combined experiences of a Monet “Haystack” and Wagner’s “Lohengrin” jolted him, at 30, to leave Russia for art study in Munich, he had rebelled against the academy and organized like-minded colleagues into the Phalanx. He would go on to become the founding president of the New Artists Association in Munich in 1909. Two years later, when that body chafed at his abstract tendencies, he left to form the Blue Rider group with, among others, the painters Franz Marc, Alexej von Jawlensky and Gabriele Münter, for whom he had left his first wife in 1907. The outbreak of World War I forced him back to Russia, where he joined the Constructivist experiment, as well as the government bureaucracy. In 1921 he and his new wife, Nina, repaired to Berlin, pushed by physical privation and the rejection of Kandinsky’s teaching ideas. By 1922, he was teaching at the Bauhaus and living next door to his great friend Paul Klee. But this idyll ended when the Nazis closed the school in 1933. Then it was on to Paris, the last stop, where he worked, despite increasingly scant art supplies, until his death in 1944. The Guggenheim’s lean, clean presentation makes the show as much a Kandinsky-Wright reunion as a retrospective. After Kandinsky’s early chivalric fantasies and landscapes with their vivid stained-glass colors on the rotunda’s first level, the compositions explode into centrifugal abstractions and semi-abstractions that echo Wright’s plunging space-for-space’s-sake rotunda. Nearly each of the exploratory works from 1909 to 1914 — there are more than 40 here — is a hole in the membrane of observable reality that reveals a nonobjective cosmos defined by tangles of line and colored shapes and shadings. Each is a brave new crowded world in free fall, full of more forms, colors and agitation than any single painting needs. 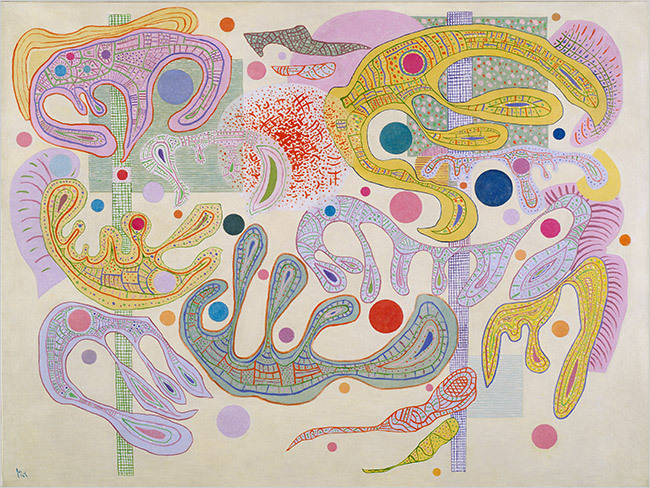 But mainly the show offers an unencumbered view of Kandinsky’s painting career and a style that he adjusted with every change of setting, tending toward Constructivism in Moscow, toward Klee at the Bauhaus and toward a Surrealist-tinged biomorphism — for which he had laid the groundwork 20 years earlier — in Paris. Not surprisingly, he bristled at the suggestion that he had been influenced by Arp and Miró. Kandinsky’s stature is always a bit wobbly in New York, where the Modern’s heavy-duty Francophilia has had such a long run. This show allows reassessment of the conventional wisdom that his art went into fairly steep decline after 1921, or even 1914. I think one problem is that Kandinsky did not make cleanly resolved masterpieces. He never painted a perfect picture. His Munich abstractions, which contain hints of landscapes and of his mounted knights, in particular defy resolution. They try to catch art’s transformative powers in the act and are in essence Process-Art narratives. But the surprise of this show is the strong case it makes for Kandinsky’s long-disparaged Paris paintings, where his colors fade to delicate pastels, his brushy surfaces tighten up, and he catalogs biomorphic form to an extent unmatched by any of his colleagues in that city. Unlike the Munich pictures, which for all their wonderfulness are somewhat repetitive, these paintings are different every time out. The view that these works are finicky, designy period pieces doesn’t recede entirely here. But with time, the notion that a great artist’s late phase has once more been seriously underestimated could prevail. Kandinsky, the most well-rounded and compleat of Modernist prophets, always had more ideas than he knew what to do with. At the end of his hectic, productive life, he finally began to lay them out one at a time. This marvelous show starts settling the dust. “Kandinsky” opens on Friday and continues through Jan. 13 at the Guggenheim Museum, 1071 Fifth Avenue, at 89th Street; (212) 423-3500, guggenheim.org.